For questions or feedback you can always visit our Forums and take part in discussions. What is MBase and what does it do? 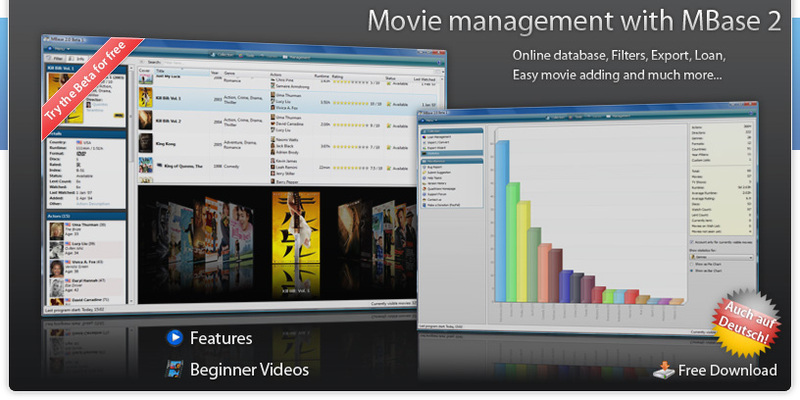 MBase allows you to manage your movies in an easy and comfortable way. With the help of an online database you just need to enter the title and MBase will fill out the fields with the appropriate data on its own. Covers and also even the actors (their birthdays and photos too) are automatically added. Our software is optimized for large data sets and is therefore very fast. Lots of additional features such as Detailed Statistics, Loan Management (with History), Export to PDF / Excel / iPod / HTML / XML / ..., different views (incl. VirtualFlip) and much more to discover are included. The best thing of all: it's completely free!